This article is about the baseball player enemies named "Baseball Boys". For the level named after them and where the first appeared, see The Baseball Boys. 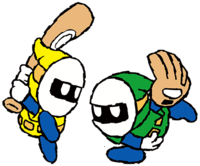 Baseball Boys refers to a pair of enemies appearing in the Yoshi's Island series, beginning with Super Mario World 2: Yoshi's Island in the eponymous level, The Baseball Boys. The enemies have a clear relation to Zeus Guys and Bandits. Aside from the physical similarities to those two enemies, Baseball Boys specifically operate using baseball equipment. They often appear in groups of two or more. Green Glove: These Baseball Boys pick up eggs found on the ground or catch them from Yoshi and throw them at him. If hit, Yoshi is pushed back. The Green Glove can be lured to send the egg into a desired target. Slugger: This type of Baseball Boy directly hits the eggs thrown at them back toward Yoshi, and can also hit objects as large as Chomp Rock Boulders rolling at them back. They will also swing at Yoshi if he gets too close. Grunts also greatly resemble the members of the Baseball Boys. Baseball Boys are similar to Chargin' Chucks, who appear in Super Mario World, in some respects. Both groups appear to be athletes of an American sport, and both take three jumps to defeat. Also, Yoshi can't use his tongue against the two groups either. Together, Green Glove and Slugger appear as a spirit in Super Smash Bros. Ultimate. This page was last edited on December 26, 2018, at 04:35.